Inequality of wealth is inequality of power. A study just released finds that «America’s 20 wealthiest people – a group that could fit comfortably in one single Gulfstream G650 luxury jet – now own more wealth than the bottom half of the American population combined, a total of 152 million people in 57 million households». How much political power do the people who would be inside that jet – and their friends – actually have? The first-ever thorough scientific and academic study of whether the US is a democracy was published in 2014, and it finds, as an overwhelming statistically established fact now, that the US definitely is not a democracy. This landmark study, by Gilens and Page, finds that, «When the preferences of economic elites and the stands of organized interest groups are controlled for, the preferences of the average American appear to have only a minuscule, near-zero, statistically non-significant impact upon public policy». Conservatives tried to deny the very meaning of this study by saying such things as that «America is a republic, not a democracy», but they were just trying to distract from the findings, which are: the US is a dictatorship, not a democracy. A republic is simply another word for a «democracy». Every democratic nation functions by means of elected representatives. So what? The «republic» matter is raised only to distract away from the reality, not in order to understand the reality. No matter how much the conservatives try to cheat or lie their way out of the reality, America is a dictatorship. 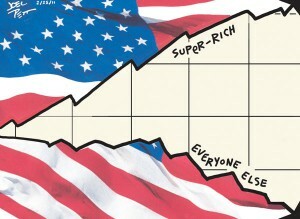 There is simply no getting around the fact: America is a dictatorship, by and for the richest. The landmark Gilens-and-Page study found the elected representatives in America don’t actually represent the public nearly so much as they represent the people who finance the political campaigns that sucker the voters to vote for the aristocracy’s preferred candidates. America’s reality is rule by the richest, rule by the people who finance those TV commercials and political operatives who make a political winner a political winner in this republic of the richest, this government of the people, by the super-rich, for the super-rich, who make the actual decisions about which candidates will have a chance to win, and which won’t. Just the way that the Grand Ayatollah in Iran chooses which candidates there will have a chance to win the Presidency, etc., America’s few super-rich here choose which candidates will have a chance to win the Presidency etc., and which won’t. In Iran, the Grand Ayatollah is chosen by, and serves, the mullahs; and, in America, the Party chiefs etc., are chosen by, and serve, the super-rich. In America, the aristocracy wanted Saddam Hussein removed and replaced in Iraq, «regime change in Iraq»; so, it was done – the public were suckered into supporting an invasion (and then into re-‘electing’ the man who did it). There is no accountability for the aristocracy’s agents (such as President Bush, or President Obama). None were prosecuted for the tortures and murders and destruction that were done to Iraq, and for the trillions of US taxpayer dollars that were spent by us to perpetrate that destruction of Iraq. America’s aristocrats and their agents call America ‘the opportunity society.’ (Read all about it there, from Obama, and also from self-acknowledged Republicans. But, of course, Obama is playing the ‘good cop,’ to their «bad». The man who was Obama’s chief economist, Larry Summers, does the same. Their propaganda-line sounds as if it comes from central headquarters.) As if equality of opportunity can actually rise while inequality of wealth is rising. It can’t really happen. The PR line is only for fools. The aristocracy enjoys playing the public for suckers. How else could the aristocracy continue to exploit the public? How much longer can it continue? «President Obama needs to mail Rahm Emanuel a dead fish in a box. Hillary Clinton should deliver it. For the integrity of the party that represents a vast majority of black voters, Democratic leaders everywhere need to send the Chicago mayor a message: You’re dead to us. A longtime lieutenant for the Clinton family and former chief of staff in the Obama White House, Emanuel never hesitated to muscle weak or disloyal Democrats out of power. It’s time to flip the script on the enforcer nicknamed «Rahmbo». I’ve got nothing against Emanuel. I’ve known him since 1992 and benefited from his strategic leaks in the Clinton White House. And I know this: Emanuel epitomizes a brand of politics that puts loyalty and electoral success above all else. He was educated in the school of Clinton, where the ends justify the means, and ruled the Obama White House when it capitulated to the culture of Washington that his boss had vowed to fight». Then, Fournier summarized the lengths that the Emanuel Administration went to cover up their murder of this Black – for which cover-up they charged Chicago’s taxpayers $5 million. Obama himself has been the biggest cover-upper of American corruption. He refused to prosecute Bush, Cheney, the banksters, the torturers, etc. He lied by saying «we need to look forward as opposed to looking backwards», and the UN called him on it. (Aristocrats don’t mind that; the UN has no teeth; and aristocrats own the ‘news’ media, so America’s public won’t know anyway.) This is how the aristocracy works. It is non-partisan. Most aristocrats are right-wing, but some are left-wing; and, yet, when it’s the aristocracy versus the public, the aristocracy are united – and the public get conned worse than ever. For example, the US aristocracy were united not only on seizing Ukraine, but in slaughtering Ukrainians who rejected the seizure. America’s elite Brookings Institution even urged the US government to step up the slaughter. The US line was that the victims there were simply ‘terrorists,’ or ‘pro-Russians.’ They were actually the residents of the areas that had voted overwhelmingly for the democratically elected Ukrainian President whom the US aristocracy overthrew. The American aristocracy said he was «corrupt». So were all other recent Ukrainian Presidents – but the US ‘news’ media politely avoided mentioning that fact. And Ukraine now is more corrupt than ever – and a lot more in debt: bankrupt. When the American government is prosecuting a blue-collar crook, it doesn’t «look forward as opposed to looking backwards», but, when prosecuting a white-collar crook, especially if that’s an aristocrat, then, for some mysterious reason, it does. «Looking backward» is only for blue-collar crimes – the type of crimes that the aristocracy want to be prosecuted, because that type isn’t the aristocracy’s specialty (which is generally fraud). What ‘justice’ is this? It’s ‘justice’ to fool suckers. The fish rots from the head, in Washington. No matter, Republican or Democrat, the American public’s Commander-in-Chief is the American aristocracy's Commander-in-Cheat. He or she is the head, in Washington, and it smells much the same, either way: like rotten fish. «Today’s reality is that the voices of «we the people» are too often drowned out by the few who have great resources. And when the fundraising cycle slows (it never stops), lobbyists take over in a continuing attempt to gain influence over and access to elected officials. The Court is bound, however, to follow the Supreme Court and Second Circuit's clear guidance. Accordingly, the Court holds that the limitations contained in New York Election Laws §§ 14-114(8) and 14-126, as applied to independent expenditure-only organizations, cannot prevent quid pro quo corruption». Of course, those higher-court ‘Justices’ had themselves been appointed by corrupt federal officials, including US Presidents. The US aristocracy holds iron control. 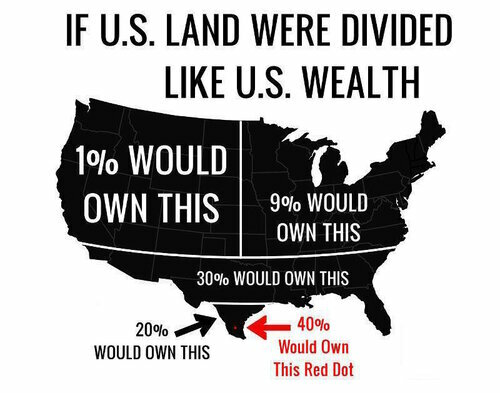 And, so, the fish keeps stinking, and the aristocracy keep lying and pretending that America is a ‘democracy.’ And the public are told that the only problem is inequality of opportunity, not inequality of wealth – no matter how enormous that inequality of wealth is. After all, there’s a self-sustaining aspect to any aristocracy. Their children even get «legacy admissions» into the elite’s colleges. So: the more extreme the wealth-concentration is, the more-extreme it will be in the future. But, no matter: «America is the land of the self-made man». And the suckers keep on believing it. People just get accustomed to the smell. The preachers tell them that it’s somehow ‘the will of God,’ and so must be ultimately good. The preachers and teachers know where their money is coming from, too. And, if it’s not coming from the right people, there won’t be much of that sweet smell to cover over the fish-stench. So: worshipping The Almighty is taught – even though it actually means ‘Might makes right’ (which everyone knows to be wrong). So: everybody does what he must do to «go along to get along» – with «the right people», of course. And this is called ‘the free market,’ and ‘democracy,’ though it’s neither. It is, instead, as bad as it smells, even if its direct victims, such as Iraq and Ukraine (just to mention two nations that America’s aristocracy destroyed), smell even worse. If you want to know how bad and how scary it really is, see the documentary on the Edward Snowden case, Citizen 4; but, even that documentary pulled its punch by limiting to only a single enigmatic sentence its bare reference to the international aristocracy behind it all, whose agents are stealing the public’s freedoms, in order to expand those aristocrats’ now-unprecedentedly sophisticated network of control over the publics throughout the world. It’s no longer just government, and the press, and the ‘intelligence’ agencies, and the military and the police. This is no longer science fiction – it is control over the mass-public, the termination of democracy, in all but name. It is already, and frighteningly, science-fact. This is why the last American President before our new system started to become instituted, Jimmy Carter, recently despaired in public, that America has become a dictatorship. And this is an increasingly global dictatorship. It’s where the global fish-head stinks the worst. Not to expose it is to hide it – to become part of what promotes the stench, not part of what would reverse the rot that causes it.